At Drink, we believe that creating a sustainability report is just the start. Reaching out to your stakeholders and bridging communication gaps is what will truly deliver results. Working with clients who want to maximize communication channels is something that we always look forward to. In 2016, Universal Robina Corporation (URC), the first Philippine multinational, needed to communicate its new strategic sustainability framework to its various stakeholders, most especially its investors and employees. Tapped to craft URC’s 2016 sustainability report Our Purposeful Transformation, Drink also proposed that URC’s messaging be amplified via a microsite and an informational video for its stakeholders. 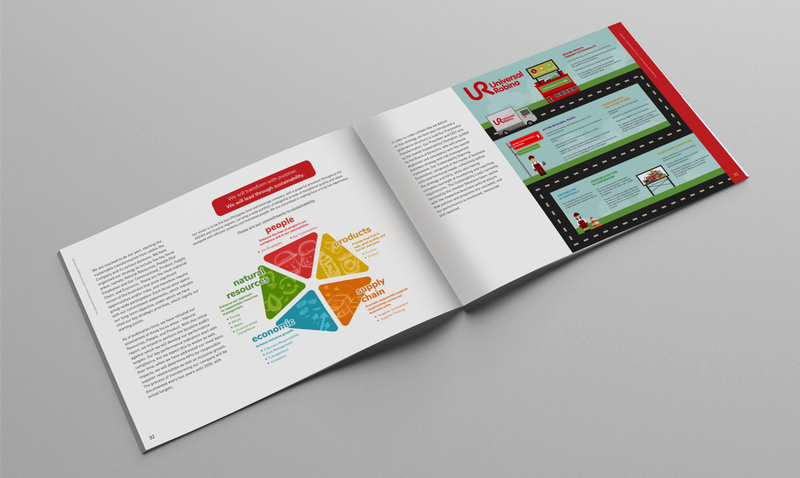 URC’s culture is a blend of the traditional and innovative. Adjustments were made by the more-than-60-year-old company to align itself with its newly articulated sustainability agenda. For its inaugural report, URC would start with a GRI-Referenced report, reflective of baseline data, at the initial stage of its transformation in 2016. It was understood that data coverage would become progressively more comprehensive with each succeeding report. Print and digital formats would be used as communication tools. Print versions are a familiar format for the intended audience. The microsite will be particularly useful for investors who are interested in specific sections of the report, as they will be given the option to select these particular sections to download. Ultimately, the SR would show how URC is transforming itself into a more sustainable company by providing the pertinent economic, environmental, social, and governance data of interest both to investors and the general public. The AVP should be able to drive home the messaging that URC is serious about sustainability: that its entire value chain (with emphasis on resources, people, and product) will be subject to improvement. To do this, various business units, including manufacturing units abroad, needed to be featured. Representatives from all levels, from the fields to factories to the boardroom, must be given a voice. The main focus of the report is to gather the best practices across URC and glean the strengths and opportunities for improvement. Areas for collaboration will also become apparent in the process of reporting. Post-report, this could be a progress point for the company, moving forward. Drink applied design thinking to present the data in its most engaging form via infographics and storytelling in the report itself, as well as an easily navigable microsite, and a highly dynamic AVP. URC had tapped its consultant and long-time Drink collaborator, The Purpose Business, to formulate its sustainability framework. Drink brought the various URC business units on board through a kick-off activity and sustainability workshop, consolidated the data URC provided based on their materiality, and wove this data along with one-on-one interviews into human interest stories. Drink took the company’s branding aesthetic and gave it a modern twist by using solid colors; playful graphics; subtle iconic textures; modern typography; and a cohesive layout. Photographs documented not only the industrial side of URC, but its relevance to people’s lives, capturing moments with delighted customers. 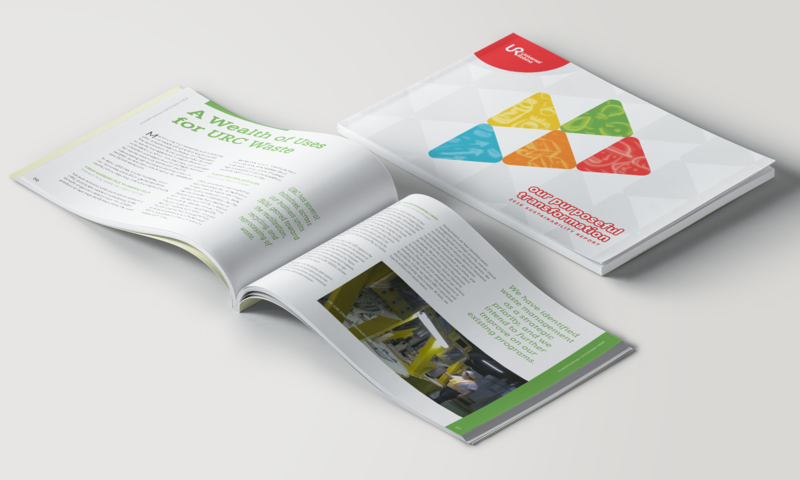 While the report primarily covered Philippine operations, Drink made sure that URC’s context as a multinational was conveyed, tackling stories such as the best-in-class waste management practices in New Zealand, and URC-wide product quality management, including in Vietnam. The AVP’s production also took the Drink team to Vietnam and Thailand, where interviews with factory and laboratory personnel were conducted to seed the communication materials. URC communicated its new sustainability framework and acquainted its publics to its purposeful and progressive transformation. The launch of Our Purposeful Transformation was well-received, particularly with an AVP that showed “one URC.” URC saw a boost in stakeholder confidence following the launch of not just the SR itself but also the microsite (notably, the AVP is also embedded in the microsite). URC has demonstrated its sincerity in pursuing sustainability by disclosing both its triumphs and its tribulations. It continues to show leadership in the ASEAN and Oceania by following through on company-wide initiatives (i.e., healthful products, integrated waste management, energy management synergies, etc.) and its commitments under its transformative sustainability framework.